Wishing everyone a very happy sankranthi!! Mom and dad eare here and its so much fun to celebrate this colorful festival with them. One of my favorite things to do on sankranthi other than flying kites is eating all yummy pindi vantalu with nuvvulu(Sesame seeds) especially laddus. 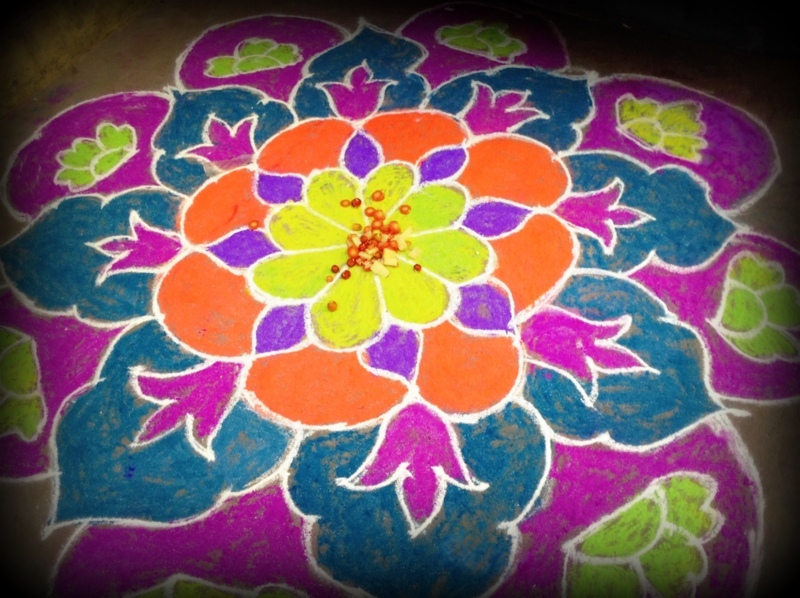 Do check out my colourfull rangolis too mom helped me, I am not very good but have improved lots after marriage. 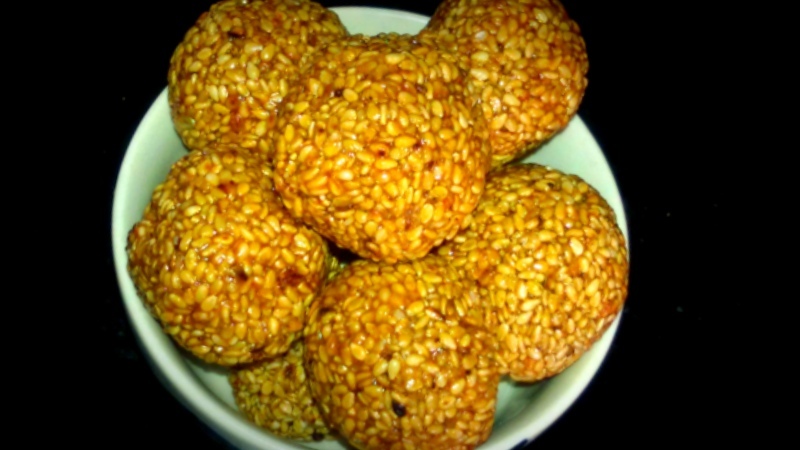 Nuvvula Laddu is made with sesame seeds and jaggery. it is a quick and easy authentic and popular recipe in India. This is a simple recipe made on festivals especially sankranthi!I remember making some last year for my office colleagues….everyone loved them! These are pretty simple to prepare with only two basic ingredients . 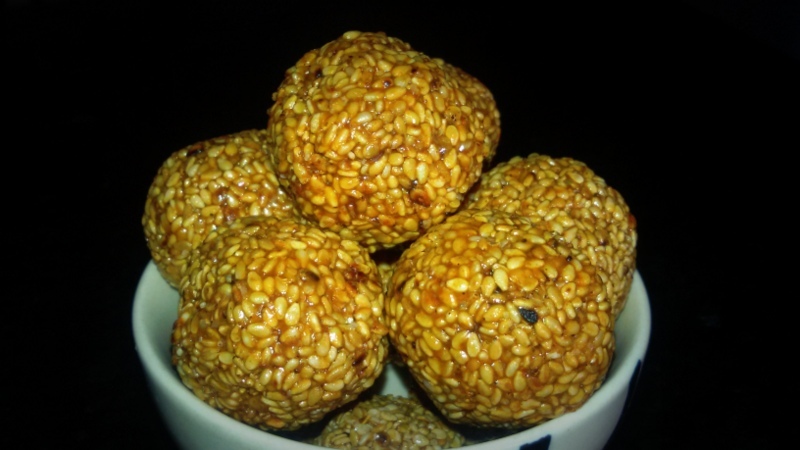 The secret of good nuvvula laddu will depend on the quality of jaggery and sesame seeds. Always use fresh sesame seeds and good quality jaggery to enjoy the chewy nutty taste of sesame seeds and the sweet flavor of jaggery. Now lets learn to make these healthy,tasty and easy Laddu’s. Dry roast sesame seeds in a frying pan on medium heat. Keep stirring continuously. Once they turn into light golden brown colour turn of the flame. In a not stick pan heat water and jaggery, simmer over medium heat till it starts caramelizing and forms a ball when you add a drop of syrup in cold water. This should take around 6 to 7 minutes. Reduce the heat to low. Remember this is an important step as the syrup binds sesame seeds into laddus. Add ghee, cardamom, and roasted sesame seeds mix it thoroughly with melted jaggery. Use a spatula always. Transfer this mixture on a greased plate, once its is little warm to work with take tablespoon of mixture in your palm and make them into round ball. Store in an air tight container and they stay good for a week to ten days. Yenjaaai! !